Shopper's Paradise is a tycoon game and as such, it is geared towards you being an entrepreneur and operating your own business or businesses. In this case, these businesses happen to be retail stores that vary from ice cream shops to mega furniture stores. Your aim will be to get the most customers, buy out the competition, generate a substantial amount of money, or a combination of the above. We have covered most of the plot in the introduction, but we will go into a little more detail in this section. The game is mostly based on strategy — you will be given a certain amount of money to start with and it’s up to you to spend it wisely to achieve the set goal. In essence, you will have to decide which stores to buy and build and which lots to build them on. Each store has its own cost as well as its average sale and the number of shoppers that can be in it at any given time. You are also given a set number of days in which to achieve these goals so spend wisely. The Shopper's Paradise game has two versions, the free version and the paid one. With the free version you are only given three levels. Each map has three sections, separated into easy, medium and hard. The free and paid versions are played the same way, but the paid version is equipped with a lot more levels that get more difficult as you advance. Scoring is done similar to golfing, where you are given a “par” which represents the number of tries that you are expected to actually complete the level in. Therefore, depending on how many tries it took you to complete a particular section, your score will be minus par, par or over par. The exact numbers will be displayed. In any case, scoring is the least of your concerns, you will realise that the gameplay is where all the fun is. When the game begins and you select a map, you will then get to choose the difficulty level that you wish to play at that point. All difficulty levels have the same goal, but the amount of money you are started with and the AI counterpart will operate a bit differently. Once you have selected your map and your difficulty level, you are ready to play. When the game begins, you will know exactly how many days you have to achieve your goal and what the goal is. Let’s say that the goal is to make $20,000 in total earnings with the start-up cash of $2,500. You will now have to decide, which shop will be the first to buy based on what you can afford. There is an ice cream store costing $1,000, a clothes store costing $1,500 and a shoe store costing $2,500. You can choose to open an ice cream store and a clothing store or just one shoe store with the start up cash. You are probably thinking that the obvious choice would be to open two stores instead of one, but you also have to consider the average amount of money that a shopper will spend in the stores and the number of shoppers that the store can accommodate. This information is presented to you when you go into the list to open a new store. In this case, the ice cream store has a capacity of 4 shoppers and makes an average sale of $5, the clothes store capacity is also 4 and makes an average sale of $15, and the shoe store also has a capacity of 4, but makes an average sale of $40. The choice is yours. 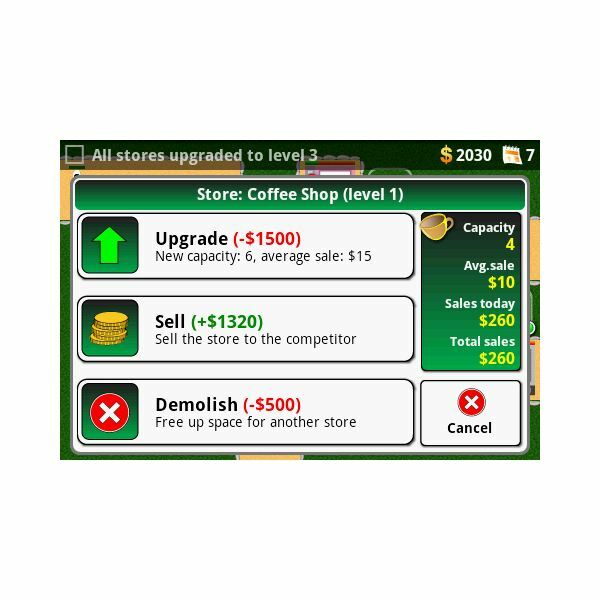 Additionally, you can upgrade your high returns stores so that they can accommodate more customers. Each store can be upgraded to level 3. The cheapest store costs $1,000 and the most expensive store costs $25,000. Here is a tip, if the goal of a particular map is to make a lot of money then try buying an expensive shop first, instead of splitting up the money to buy more than one cheap shop. By sacrificing the first day or two, you should make a lot of money to buy even more expensive shops to make you even more money faster or to upgrade the existing ones. When you make an upgrade, you store holds more people and the average purchase increases. These are the things that make this game so much fun. You are not only racing against the clock (number of days) but you also have to compete with the AI entrepreneur who is also buying up the limited number of lots and opening his own stores on them. The more stores he has, the more of the shopper's money you will have to share with him. There is not much to be said on graphics, because the graphics are superb! The game is pretty simple so a lot of console type graphics are not needed, but your stores are clear and sharp. You don’t have to guess what type of store each is supposed to be because they all come with their little logo that tells you what they are. The shoppers look like little black dots, but if you look closely, you will realise that you have an aerial view and those little black dots are their heads. They also have an accompanying bar that shows you how much money they have left to spend. This is a really great game that will have you caught up for hours. It may slow down a little sometimes especially if your phone has something running in the background. If this happens, I find that coming out of the game and re-entering brings it right back to full strength. There have been reports of some BlackBerry users saying that the game freezes for them after they have bought the full version; I have bought the full version and have not had any problems yet. I am using a BlackBerry Curve 8520. So what I am saying is this; if you like strategy and shopping, you will love Shopper's Paradise. View all supported BlackBerry devices and Purchase Shopper's Paradise for BlackBerry for only $4.99 USD; or Purchase Shopper's Paradise for Android for a limited time offer sale price of $2.99 USD. All references and screenshots from Shopper's Paradise for BlackBerry.